The chances for infidelity healing and the possibilities for stopping the affair and overcoming infidelity are greatly enhanced once it sinks into your heart and soul that you are not at fault for the affair. You are not defective. You did not cause him/her to jump into the arms of another person. You are not to be blamed for the infidelity. Overcoming infidelity means coming to this awareness and strong belief that you are not at fault or to blame for his/her actions. This infidelity healing liberates you from the debilitating infidelity feelings and thoughts and sets you on a new course of action and healing. As well, the capacity for you to intervene in the life of the affair in a highly effective manner is magnified. Most, when confronted by the infidelity are grabbed, held and immobilized by this sense of defectiveness and personal responsibility for his/her actions. Here are 4 ways of shifting your thinking when overcoming infidelity that will acclereate the infidelity healing and bring relief from the sense of blame and fault. 1. O.K. Accept the fact that in your relationships you made mistakes. Yes, you did. Some of them were maybe fairly large. But, who in a relationship of investment doesn’t make mistakes; some of them silly, some of them large? Could you have done something differently? Of course! We all could have. Coulda, woulda, shoulda. And even if you made NO mistakes, how boring and predictable would that be? Yawn…..
2. come to the realization that the decision to enter into an affair is his/her personal decision. A rather poor decision, but his/her decision nonetheless. You see, affairs have nothing to do with love (although you probably believe or s/he says s/he fell out of love with you and loves someone else) but more with three different factors. Someone may choose an affair as a result of a character disorder (“I Don’t Want to Say NO’). Or, s/he chooses an affair as an attempt to deal with a dysfunction life-long coping pattern (“I Can’t Say No”). Infidelity is a blind attempt to manage one’s inner ghosts. 3. In conjunction with the realization of his/her personal ghosts is the relief you experience once you dig into learning about the characteristics of someone who would enter a specific kind of affair. 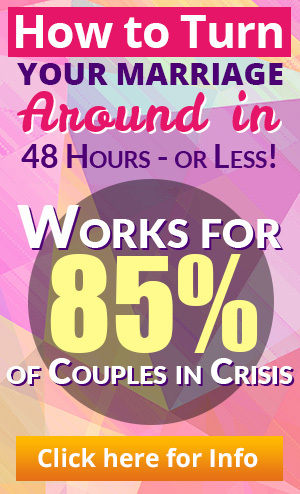 I outline 7 distinct types of affairs in my ebook, Break Free From the Affair. A person is likely to choose or act out a particular kind of affair depending on his/her personal characteristics. I list in detail the characteristics of a person likely to choose that type of affair. 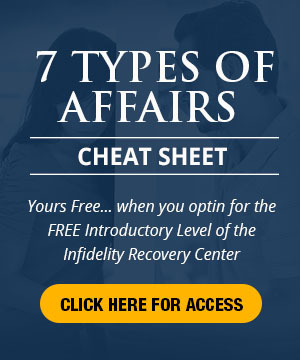 Click below to find out more about the 7 different types of affairs. I’ve received hundreds of emails from the wounded spouse exclaiming his/her relief once reading over the lists. Such comments as, “This is him/her to a “T.” Wow! this is right on! Now, they have a handle, a different handle on what they are facing. It makes sense. There is a pattern. Their sense of personal chaos is diminished. 4. Another significant shift in the “fault” game occurs when you discover that the OP (other person) is not “better” than you. You may realize someday that you truly or worthy and have value as a person, and you need not compare yourself to the other person. Or as you begin to understand the dynamics of infidelity you discover that health and saneness is on your side. My theory (hatched in over 25 years of clinical practice, research and my conclusions about the nature of humanity) tells me that eventually those who benefit MOST from infidelity are the wounded spouses. Why? They typically become the ones who in their pain, confront themselves, learn, make shifts in their thinking and feelings and redesign themselves in ways that are more harmonious with whom they truly are. The cheating spouse? Well, s/he misguidedly throws him/herself more and more into his/her personal neediness, character disorder or coping pattern dysfunction. His/her emotions, values and behavior goes down the tubes, although s/he at that moment of infidelity and attachment to the other person may deny so. That’s why the divorce and unhappiness stats for those who have an affair, divorce and marry another are exceedingly high. No learning, no personal evolution has emerged. At some point s/he may discover that s/he has taken him/her self with him/her… and that is the problem. These shifts in your thinking are indispensable in getting on the path of health, well-being and as that happens welcome your new found personal power to shape your life, perhaps the path of the infidelity and perhaps the path and direction of your marriage or relationship. Where’s Your Focus When Overcoming Infidelity in Marriage? Overcoming infidelity is not easy, but the resources above can help to ease the pain and provide you with some reassurance that the affair is not your fault and you are not alone.